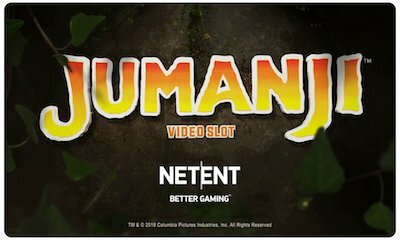 Given the UKGC’s clampdown on slots that may appeal to children, it’s perhaps a surprise to see a Jumanji slot launched by Net Entertainment. Jumanji first hit the movie screens in 1995 with Robin Williams in the lead role. However the story is based on a book written in 1981 written by Chris Van Allsburg. More recently, Dwayne Johnson starred in a sequel to the Williams’ movie but the slot is based on the latter. This is a 5 reel slot, but it has a geometric 3-4-5-4-3 column format with 36 paylines. The reels are set looking down into a room and within the board game. A trio of monkeys occupy the corner of the slot and game play is accompanied with dramatic music. Graphically this is a very impressive game. The main symbols are animals from the film. these include a lion, rhino, crocodile and pelican. The lion is the top paying symbol at x140. The remaining symbols are A, K, Q and J. Wilds and Scatters complete things. Wagering starts at just 10p a spin. Adjust the level and coin value to increase the maximum bet up to £200. An autoplay option and max bet button are available. The game is accessible via mobile, desktop and tablet. The Jumanji slot boasts an exciting range of features. These include Sticky Vines which result in respins being activated and Monsoon Wilds which create columns of wilds. These are joined by Monkey Mayhem where the reels are reshuffled and Wild Stampede where rhino turn 4 to 9 symbols to wilds. The board game itself does play a pivotal role in the game’s main bonus feature. Get 3 or more scatter symbols on the reels to activate the bonus board game. The number of scatters determine a number of dice rolls. Land your counter on the free spin features to activate them. The free spins are similar to the random game features. 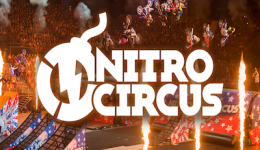 They include Vine Free Spins, Monsoon Free Spins, Monkey Free Spins and Stampede Free Spins. In addition there’s a mystery feature. 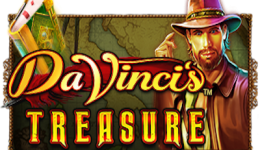 Land on this to potentially win a free spins feature, extra dice rolls on coins. Jumannji Slots is a medium variance game with a RTP of 96.33%. If you’re expecting to see Robin Williams or The Rock in this game then you’ll be disappointed. However, if you’re a fan of Jumanji and quality slots then you’ll be pleasently surprised. The graphics are excellent and NetEnt have set the bar high for all movie themed games to come. The biggest disappointment is the low maximum win however, with limited symbols wins should be frequent. Overall, it’s an impressive slot – we just wonder how long it will be before The UKGC decide that it movie titles aren’t allowed as slot games. New Players Only. Minimum deposit £10. Max Bonus £200. 10 free spins on registration. Deposit £10 or more and receive 40 free spins - Deposit £50 or more and receive 90 free spins. Free Spins (35x wagering). Deposit Bonus (35x wagering). 18+. begambleaware.org.